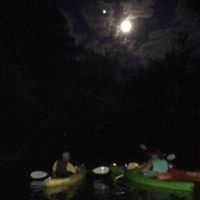 Saturday June 30 join us for a moonlight float at 8 pm. Meet at the Germantown Dam kayak launch at 8 pm to decorate kayaks with glow lights, bring your own glow lights or use the ones we provide. Headlight bands that are not white are recommended as is bug spray. The moonlight float will begin at 9 pm and last approximately an hour. Hope to see there. Kayaks will be available to rent at the launch site. Print a wavier online save time at the kayak launch.